VIKING UNMANNED AERIAL SYSTEMS researches, designs and manufactures innovative technologies for hobbyist and commercial applications. Our goal is to provide our clients with high quality products, unparalleled customer service and competitive pricing. We focus on the needs of the customer. We listen to those needs and leverage our expertise to deliver high quality, cost-effective solutions. Our principle partners offer over 15 years of combined UAS experience. You can be assured that if you have a specific need we can provide a solution with confidence. Viking UAS is only UAS/UAV Aircraft manufacture that offers a complete testing program. We provide the customer with an engine run up test data, performance data package, video of the test and a complete electronics failure cycle test. This commitment to building a cost effective, but high quality products is what is separating us from the competition. If your not 100% satisfied, we're not 100% satisfied. There are many environmental requirements related to keeping oil & gas facilities operational and safe. Viking UAS offers multiple platforms for monitoring these important elements such as consistent monitoring of pipelines and facilities. Our UAV air-crafts can have preplanned flight routes that are plotted over Google Maps. The routes can also be changed while in mid-route by simply clicking on a map to create a new course. We offer optional monitoring cameras that range from a high power zoom camera to Thermal Imaging cameras to detect potential leaks or discover trespassers. Maybe you would like to oversee a sporting event, secure and open pit mine, closely survey a political event or even secure the parameter of a building. In most cases it's a real challenge to see all that's happening at once. A view from the air can make all the difference. One of our multiple can be deployed to be your person "eye in the sky". Launch one aircraft at a time or several all working in unison programmed to fly a route around the parameter of the event. You can even re-rout the aircraft in mid-rout by simply clicking on a Map diverting to different location. Search & Rescue is another application where where our aircraft can be utilized as literal "life savers". Our UAS Pratforms can be pre-programmed to fly a specified route to search for victims. This is ideal for avalanches, missing persons, floods, earthquakes, mud slides and more. They can be equipped with thermal imaging cameras to quickly identify bodies that would otherwise be hard to see with the naked eye. We also offer a 36X Zoom camera that has the ability see a soda can at 1000 feet. Our our platforms save money on the bottom line cost with next to no operating cost after the initial investment. You can also diversify the search with multiple aircrafts in the air at once to cover more area. This is a huge cost savings over the traditional manned plane or helicopter option. Are you curious where your cattle are located? How about if some of them are sick or deceased? What about holes or damaged fence areas where the cattle can escape? Viking UAS can be your solution to the problem. The Extreme 2.0 Multi-rotor for shorter range surveillance or one of our fixed wing options with upwards of a 15 mile-range. This can save you time and lower your bottom line cost by a huge margin over traditional methods of searching multiple acres. After the initial investment, the operating cost for the aircraft is nearly $0. All platforms can be outfitted with a choice of multiple cameras ranging from our high power zoom camera, that can read a soda can at 1000 feet; to a thermal imaging camera, that can locate animals stuck in heavy brush or wooded areas. These two scenarios could make it hard to impossible to see the animals by the naked eye. This is one of our favorite categories because we feel that our product can really make a difference in saving lives of both firefighters & pedestrians. VikingUAS has designed a series of platforms for fire fighting operations and it is an amazing tool to scout out igniting fire lines in hard to reach areas. You don't have to loose precious time waiting for a helicopter or plane to take off from the airport and fly to the scene. Simply click a few button and your on the way to the danger area seeing all the areas in questing real time form a video downlink feed before someone at the airport can even fasten their seat belts. If there is a burning building and you need to get firemen on the roof ASAP, but not sure where the hot spots are, we have a solution. The key though is being equipped with a cutting edge thermal imaging camera that can show you where the danger spots are in real time. 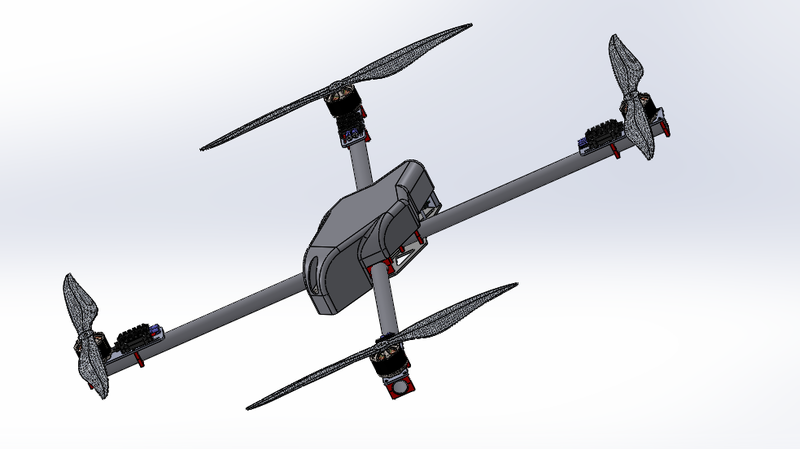 After years of designing and manufacturing solutions for this application we can guide you on the best solution for your application be it a quad copter to Octocopter or even a transition VTOL platform. Using an infrared camera on a transition VTOL or Fixed wing allows for the creation of extremely detailed 2cm/pixel NDVI images. These NDVI images can be created much more frequently and at a lower cost than through the use of satellites or airplanes. We have over 150 suppliers we have designed for that have solutions and or we can design you your own product to be manufactured here in the USA. NOTE: DUE TO OUR NDA'S WITH COMPANIES WE PROVIDE SERVICES FOR WE CAN NOT DISCLOSE DRAWINGS OR PROPRIETARY AIRCRAFT DESIGNS ON THIS WEBSITE. IF YOU WANT MORE INFORMATION WITH REGARDS TO YOUR NEEDS WE WILL NEED TO HAVE YOU SIGN AND NDA "Non-Disclosure Agreement". THIS IS NECESSARY IN KEEPING BRANDING AND DESIGNS NON PUBLIC.